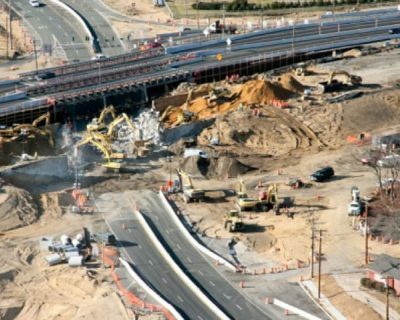 Haugland Group services a wide range of clients and project types. 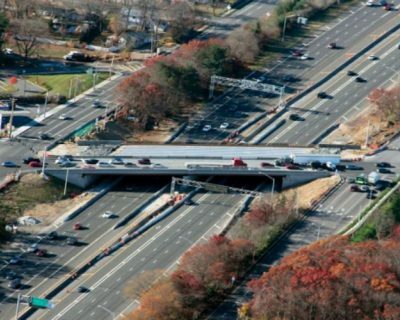 Click "Project Details" to view recent project summaries. 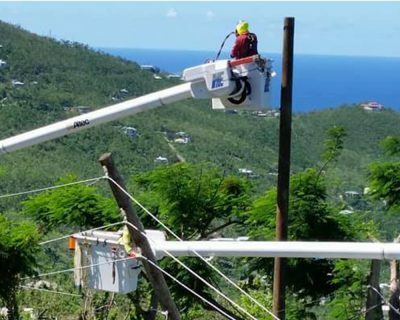 The Virgin Islands Water and Power Authority contracted Haugland Energy to provide emergency line crews and equipment for the restoration of electrical transmission and distribution systems after Hurricanes Irma and Maria devastated the area in late summer/early fall 2017. This $200+ million, three-year reliability and resiliency project will further strengthen the electric grid across Long Island and in the Rockaways. 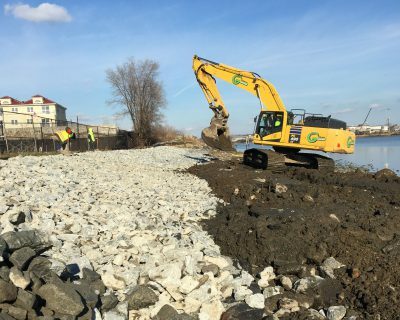 Following Superstorm Sandy, LIPA and National Grid (the previous service provider to LIPA) acquired funds under the FEMA 406 Mitigation program to implement a Hazard Mitigation Program to the LIPA transmission and distribution system. The primary focus of the program is to harden Long Isl​and's Transmission and Distribution system by upgrading approximately 450 miles of mainline distribution lines. This is an effort to increase resilience to future storm damage, and reduce the number of customers impacted by service interruptions by 20% when storm damage occurs. 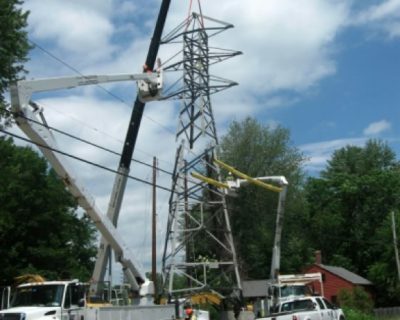 This project was designed to create a new T-Mobile cell site that included all of T-Mobile’s latest cell technologies and required replacement of a 135-foot LIPA transmission tower SP#2085, which supports two 138kV transmission circuits on it. 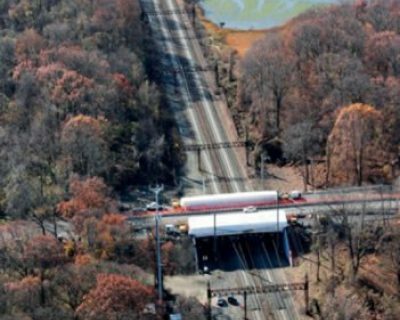 All of the tower work and the high cell site work had to be coordinated, performed and tested during LIPA/PSEG transmission circuit clearances. Ground work included construction of an 11’ x 30’ enclosure housing the cell site compound equipment inside. Rebuild existing 34kV to 69kV standards, including but not limited to: install conductors, overhead shield wires (OHSW), fiber optic ground wire (OPGW) and All Dielectric Self-Supporting Fiber Optic Cable (ADSS). 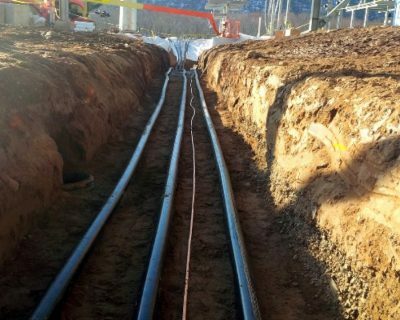 The scope of work includes the pulling, splicing and testing of underground ADSS into the remote end substations via existing underground conduits and inner-duct. Construction at a CMP Greenfield substation will support two wind farm developments. 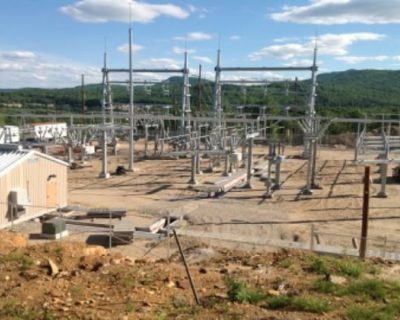 Our work on the Greenfield Ludden Lane substation includes construction of approximately 1,000 feet of 115kV transmission lines, tubular steel terminal structures, a substation control enclosure, and installation of various electric transmission system protective devices, including air break switches, SF6 circuit breakers, disconnect switches, motor operators, instrument transformers and related sensing and communication devices. This project included the removal and installation of two 115kV transmission through wetlands and ledge conditions. 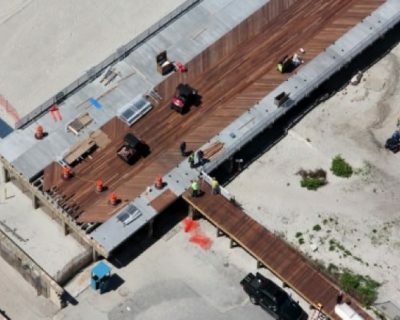 Construction of 6.4 miles circuit miles of conductor, OPGW and H-Frame wood structures were completed at 75 locations. 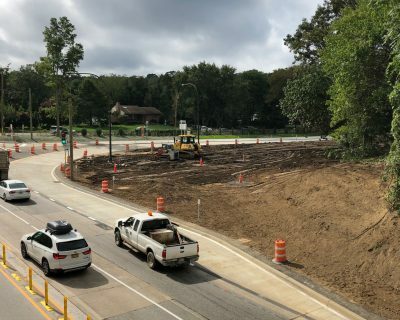 Our environmental crews, led by our in-house erosion control specialist, managed and installed 7,000 timber matts, and cleared three miles of right-of-way, then installed environmental controls throughout the right-of-way. 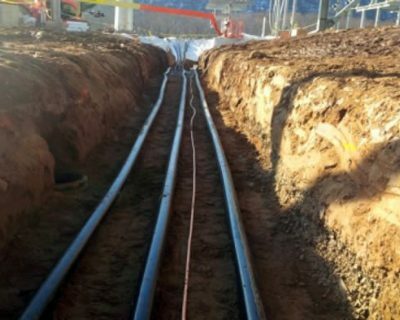 Haugland Energy was contracted to install 69kV underground transmission, 15kV underground distribution and 69kV overhead transmission at the PSEGLI Orchard Substation expansion​. 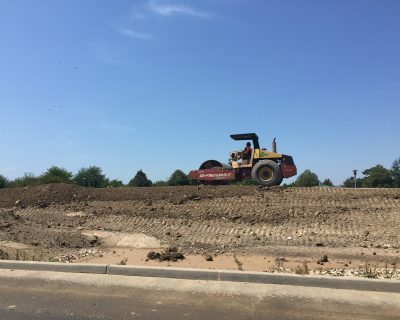 Drainage installation, grading and landscaping of wet meadow area was completed in twelve weeks with an eight-person crew. 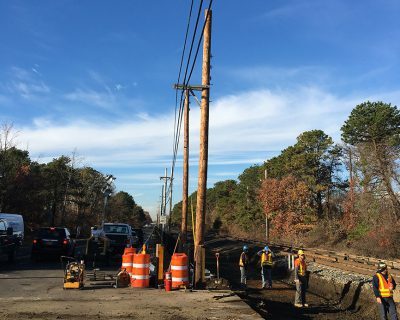 Installation of approximately 26,165 feet of two-inch Cable-In-Conduit, utilizing Horizontal Directional Drilling (HDD) technology of four NSTAR service territories located in Cape Cod, MA. Work included all required fiberglass, and/or concrete pull boxes, single-phase switching stations, grounding, bond frames, temporary and permanent restoration. 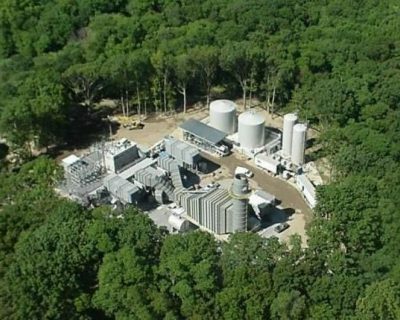 The project was performed at four locations in Cape Cod, Massachusetts in the NSTAR service territory. NSATR built a new switching station that required the installation of a double 230kV underground power cable, a spare cable and a new SF6 breaker. 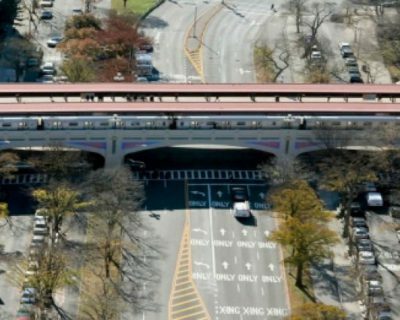 Our scope of work consisted of the installation of seven cables totaling 6,500 feet, seven terminations at one end and SF6 terminations at the far end. The cable system was a directly buried cable system, with a thermal sand back fill. The new switching station allows NSTAR to rearrange the overhead cable system and to add new lines to the system. Haugland Energy installed of 34 poles of various lengths for the relocation of 33kV and 69kV circuits. 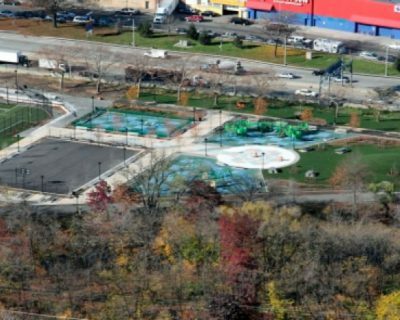 Due to six feet of flooding at the Substation caused by Superstorm Sandy, the switchgear needed to be bypassed. In addition to the poles, work included the stringing of new lines, four disconnect switches, and breakers. 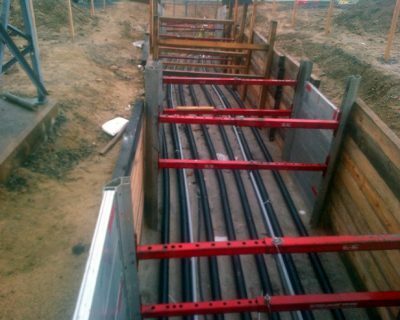 The phased demolition and rebuilding of four separate 34.5kV overhead electric transmission circuits was completed in 22 months, and included approximately 32 miles of single circuit 34.5kV conductor with fiber under build, that utilize direct embedded guyed and un-guyed wood poles, as well as self-supporting single steel pole structures with deep drilled shaft concrete foundations. 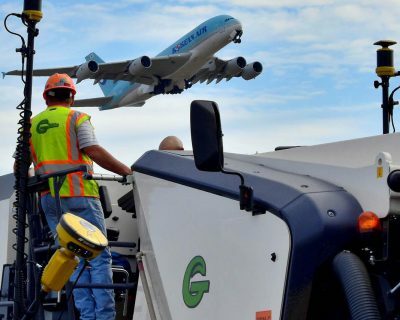 Haugland Energy performed the inspection, maintenance and testing of the Calpine Kennedy Airport Power Plant. The work included testing all protective relaying for Bus-2/13.8kV, 4.16kV and 480 volt Swbds, including instrument meters, transformers and dry air reactor. This project involved the installation of 100 sections of 35kV spacer cable, transferring existing transformers and installing secondary cable. Haugland Energy linemen are specifically trained in the practice rubber gloving voltages up to, and including, 35kV. 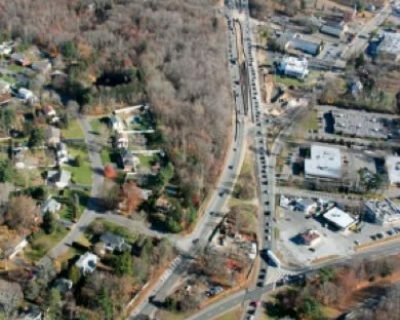 We were tasked with alleviating the overload on the overhead and underground distribution system on Line 388 in Manchester NH. 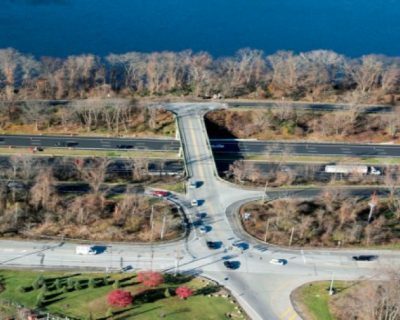 This was accomplished by installing new 50-foot poles and building a 35-section express spacer cable feeder through double circuit poles in a congested city environment. Our underground crews installed 500 mcm of solid dielectric cables through fifteen manholes and made 35kV splices and terminations. Entergy has a bi-yearly outage at each of the nuclear power units, when electrical testing is conducted and maintenance is performed on switches, breakers, lightening arresters, current and potential transformers. Additionally, cleaning and inspection of insulators, at both the Entergy yard and Buchannan Substation is completed. Our scope of work included the replacement of gaskets, oil seals, and leak repairs on lead wipes on six 138kV XLPE cable terminations. 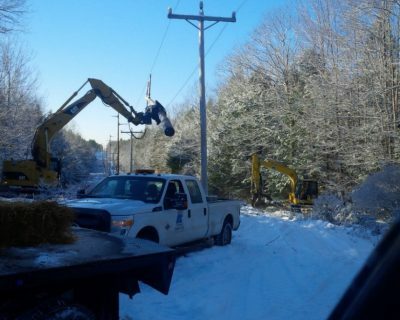 We rebuilt approximately two miles of transmission line, while the existing 35kV line remained energized. Haugland crews installed a 21 new structures, single pole, H-Frame and 3-pole dead ends. A new feeder was built around the existing substation, and the wire on the right-of-way was transferred, using the 35kV gloving method. New conductors were installed on a 1000-foot span river crossing, which included coordinating boat traffic State authorities. 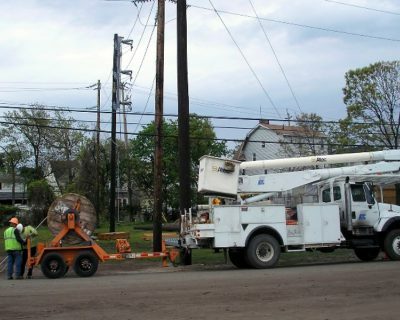 This project for WMGL required the installation of 15kV Hendrix spacer cable, along with new secondary cable, the transfer/replacement of existing equipment, and the replacement of 60 guyed and un-guyed wooden poles. During the phased demolition, the existing circuit needed to remain energized, and customer outages were prohibited. Inspection of Astoria Generating Company’s 138kV High Pressure Fluid Filled (HPFF) feeders 23161 and 23162, and manholes 70830 and 70832. These cables connect the Narrows Generating Facility to Con Edison’s Greenwood substation. 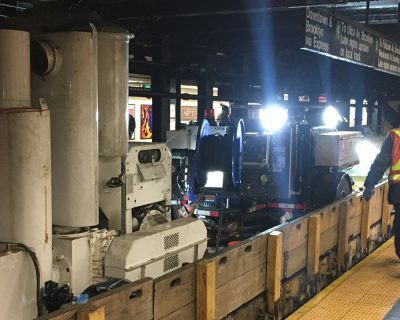 The work included photos of the pipes within the manholes, depth gauge of areas on the pipes, and removing loose coating for hidden damage evaluation.